The future mobility will be increasingly electric, for agricultural machines, too. 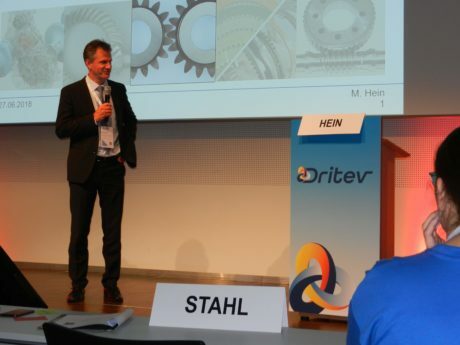 DRITEV are the initials that this year identify the maxi-convention that VDI, the association of German engineers, organizes yearly on the theme of vehicle transmissions. The acronym derives from DRIvetrain Transmission Electrification in Vehicles, with the evident explicit reference, in the title as well, to electrification, as the chairman of the conference and CEO of Schaeffler Automotive immediately explained in the opening speech. The 2018 edition of the convention was held in Bonn, too, and it scored the customary success, with the usual 1500 participants. The programme of the proceedings, after the plenary sessions in the early morning, was developed through three thematic sessions, completed by other two, which formally constituted two parallel conventions, one identified by the title E-Drive and the other dedicated to mobile machine transmissions. The latter as well, as highlighted by the title for the first, and with a glance at the presentations for the second, diffusely dealt with the power transmission electrification, in general and with specific reference to agricultural and earth handling sectors. During the plenary session, in his first speech Schaeffler talked about the “mobility of the future”: the company is studying and developing many solutions that take into account the growing limitations to which mobility, especially urban, is subjected. Bio-hybrid is a 4-wheel electrically assisted vehicle for micro-mobility and Schaeffler Mover is a “platform” vehicle, which suits different application concepts, characterized by 4-drive wheels with 90° steering capacity, just to make some examples. 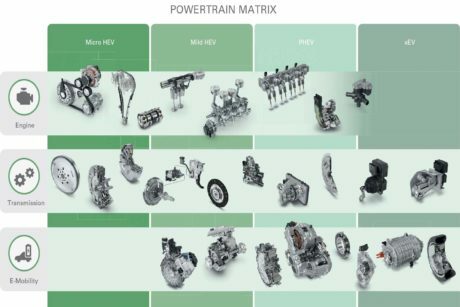 The matrix of electric transmissions according to Schaeffler. More in general, the German company’s matrix for transmission systems is crowded with numerous solutions, with different hybridization degrees and modalities, such as Micro HEV, Mild HEV, PHEV, xEV, and it acts as guide for the development of motors, transmissions and drives of the future. In the successive speech, the prof. Pischinger from RWTH University in Aachen, illustrated how, despite a vertical drop of the diesel engine market, there is not only competition but also the possibility of synergies between the internal combustion engine and the electro-mobility: the possibility for hybrid vehicles of benefitting from more efficient powertrains will unavoidably share in the improvement of the mobility of the incoming years. We expect in fact that internal combustion engines still have improvement margins and that efficiency, against a current better performance by 43%, can even reach 47%, due to the variable control of valves and compression ratio and to the water injection. Afterwards, he illustrated the advantages of the various hybridization solutions and architectures in relation to use typologies. 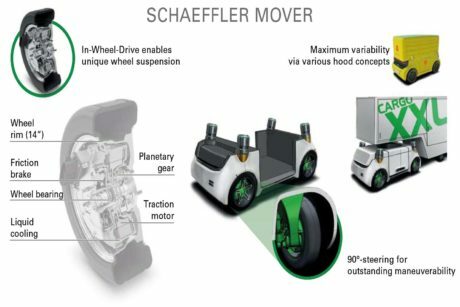 Schaeffler Mover is a “platform” vehicle, which suits different application concepts, characterized by 4-drive wheels with 90° steering capacity. However, it is worth reminding that in other geographical areas the automotive market is steeply rising and the traditional mobility is still the focus of the attention: in the plenary session again, GWM (Great Wall Motor) told the case history of the first DCT 7-speed automatic transmission fully developed and manufactured in China, with a project started in 2014 and ended in 2017. The project specifications and requisites can be compared with European standards and modularity provides for developments towards the hybridization direction. The factory where it is produced has a capacity of 1 million of annual units and is currently working at the rate of 1500 parts daily. The second part of the session was dedicated to a roundtable, attended, among the others, by representatives of Ford, Audi and AVL. Some interesting considerations and food for thought emerged still on tomorrow’s mobility issue. «Mobility plays a fundamental role for us, both as manufacturers and as users», underlined the vice- president of Ford-Werke, adding that «I see no conflict among the single modalities but instead a necessary interaction (co-modality) among all transport modes that together represent the key for a working transport infrastructure». In the opinion of Audi, «to reach the climate targets, automotive must shift from fossil fuels to greener sources. From both the environmental and the economic point of view, it is precarious to rely on just one driving technology». According to AVL, «the electrification and the autonomous drive are changing the road panorama, favouring new business models for the private transport. As engineers, we must accept the challenge of optimizing these new technologies in terms of vehicle characteristics meanwhile granting their accessibility». Among the plenary activities, it is worth reminding the evening speech, which is traditionally held in the Parliament hall of the former Federal Republic of Germany, this year dedicated to a female figure of the motor sport. The former Scottish driver Susie Wolff entertained the participants in the congress with the narration of her career, the one of a woman that succeeded in driving a Formula 1 car. Electrification was the main theme in thematic sessions, too, going into the details of applicative solutions and of different hybridization architectures. They include the electric axles or E-axle, consisting of an integrated electromechanical system, ready for installation on a vehicle, or the modular solutions that provide for the application of the electric motor to the transmission. Anyway, also in Europe conventional transmissions are constantly developing. In the session dedicated to AT/DCT (Automatic Transmission/Dual Clutch Transmission) Opel presented the project optimization and the weight reduction of the new generation of 8-speed AT. Improved also the shifting quality, the energy efficiency, the integration of functions, the lubrication and the finishes of gears. BMW as well is working at its AT to satisfy the requisites of emissions and consumptions, without anyway giving up sportiness and performances. With the third generation of 8-speed AT, ZF has reduced losses, increased the ratio range, decreased the consumption and optimized the lubrication. On the DCT S-Tronic, Audi has developed the version for the four-wheel drive, increased power and torque and made some improvements concerning the application to HV electrified vehicles. The future of agriculture is increasingly electric. The transmissions for the agricultural sector were the topic of the specific parallel convention but they were already treated during the plenary session, in particular in the speech by the vice-president of AGCO. 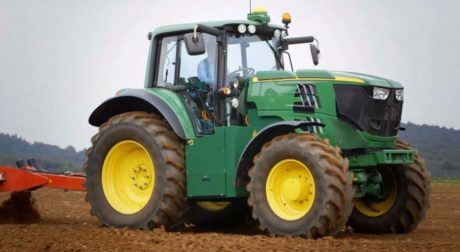 The transmissions of tractors must deal with the need of a very broad variation interval of the velocity ratio, which is today satisfied by using several solutions, like the Powershift, DCT or CVT transmissions with hydrostatic split torque. Farming 4.0 is presently the driver in the agricultural sector, which is required to enhance the productivity of harvesting operations while reducing the impact on the environment and emissions. 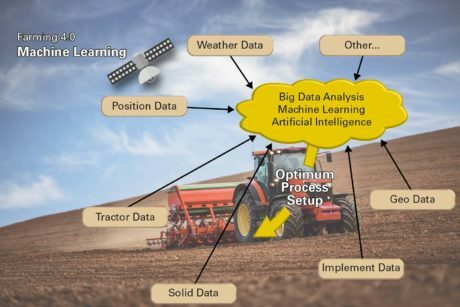 The Precision Agriculture (PA) and the integration of digital technologies allow more abundant crops, minor damages of the soil and reductions of the necessary resources in terms of water, fertilizers and fuels. Electrification can play a determinant role in this context, too. The electrification in the agricultural sector appears with manifold aspects. In fact, besides the main transmission for the advancement of the machine, subjected to the action of the resistant forces generated by operations, the work of the agricultural tractor is characterized by the presence of several rotary and linear drives for the execution of the various agricultural operations. The presence on board of a high-voltage electric plant makes the use of electromechanical drives – instead of conventional mechanical and hydraulic drives – appealing. It is possible to range from 48-V applications with powers roughly of one dozen kW, up to 130 kW with 700V. Already in 2015, for instance, Fendt had presented at Agritechnica an electric side-delivery rake with 700V plant. 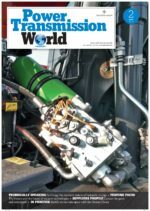 The electrification of towed machinery or trailers with motor axle is particularly interesting because it allows avoiding the presence of mechanical power transmission connections subjected to greasing. Farming 4.0 at Dritev 2018. Concerning the primary transmission, it is certainly worth considering the electromechanical developments of power split solutions that today are based on hydraulics. Systems like Vario by Fendt, or analogue others, can be in fact implemented also using an electric CVT transmission instead of the current hydrostatic one and Fendt itself has a project towards this direction. The fully electric tractor (EV), that is to say powered only by batteries and able to face the energy demand of an entire day of work, is already a reality in the ambit of small powers. The possibility of delivering high peaks of short duration and the presence, besides electric interfaces, of the standard mechanical power take offs and of hydraulic connections, make it compatible with standard applications. 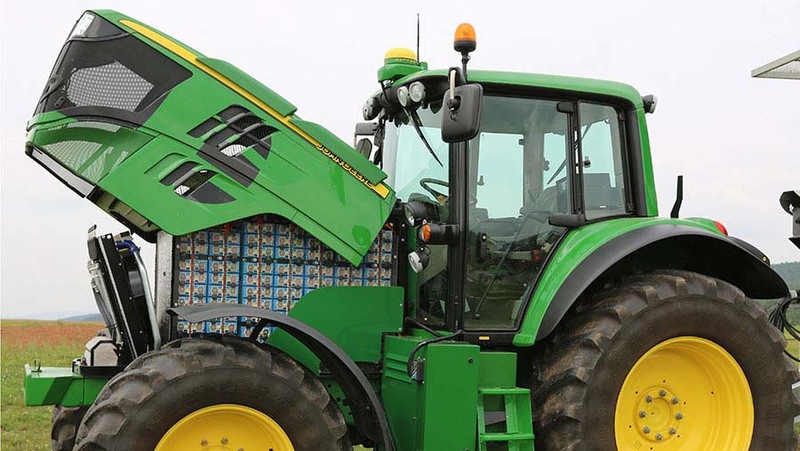 Different is the case of big-size tractors: they estimate in fact that an EV 380 kW tractor, considering a working day of 12h and a typical use spectrum, would require a system of batteries with an accumulation capacity of about 2300 kWh! AVL is particularly active in the field of the agricultural machine electrification and can offer solutions that range from the mild hybrid up to the pure electric, in the main power and voltage fields, including the generation and the distribution of the electric power to the transmission and to the drives of the accessories. Naturally, also in agricultural ambit, the electrification perfectly matches the trend towards autonomous drive systems, it too in progress. The earth handling was present besides the agricultural sector and the presentations about the transmissions of these machines by Caterpillar, Liebherr and Liugong, among the others, were not missing. The attention is drawn on CVT, too, and they work at the control, for the motor downsizing, at the performance optimization and at drive sensations, at the interventions aimed at the hybridization: Schaeffler is particularly active in the CVT front, both conventional and hybridized. Not only systems but also the components of transmission systems are constantly improved: they spoke of innovative solutions with conical clutches for AT presented by FZG, of use of high-performance steels to decrease masses, of new lubricants, of optimization of oil flows in the carter, of the thermo-hydrodynamic behaviour of oil-bath clutches, of fatigue design of transmission gears, of simulation and also of stricter and stricter NVH requisites for gears, just in relation to the application to electric vehicles. In electric vehicles, we will have fewer, but more and more performing, gears, as explains prof. Karsten Stahl from FZG. 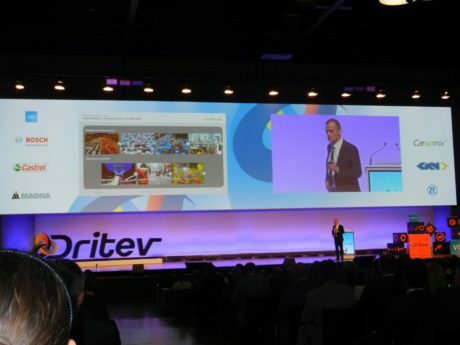 Concerning the manufacturing theme, irremissible was the reference to Industry 4.0, as well as to the new additive technologies: also in the field of automotive transmissions, the 3D printing provides new potentialities and challenges, in the ambit of both prototyping and of production, of polymeric and metal components, for which it paves the way to new geometries not achievable with conventional technologies. Besides the convention, as it traditionally happens, they fitted out an exhibition that welcomes about one hundred of exhibitors, among which the primary suppliers of components and systems for automotive drivelines. Among the several brands, stood out the names of ZF, Bosch, AVL, Dana, GKN, LIebherr, Oerlikon, Schaeffler, SKF and Siemens. Big-size stands of these companies confirmed and underlined the migration of several big brands from the component to the system: those that until some years ago were identified with the gearbox or, even, with a simple component like the rolling bearing are now suppliers of integrated transmission systems, holders of the know-how of the whole driveline, perhaps even more than the vehicle producer. Naturally, the suppliers of components and of design and simulation software were not missing, such as KISSsoft and Romax, well-known to those that work at the project of gear transmissions in other sectors, too, apart from the automotive industry. Finally, Continental presented three prototypes of e-bike equipped with their own system that attending people had the opportunity to try, appreciating the benefits and the pleasure of driving with assisted pedalling. Already confirmed the 2019 edition that will be held on July, 10th and 11th, at the World Conference Center di Bonn.